A unique collaboration between artist Bobby Niven and architect Iain MacLeod, the Artist Bothy is a prefabricated multipurpose building designed to bring its owners closer to nature. Built in Scotland from sustainable materials, it is inspired by and artist residency space conceived by Niven and MacLeod in the Scottish Highlands. The bothies have been created to work either off-grid or to be connected to electricity and water while the classic design evokes traditional agricultural dwellings designed to blend into their surroundings. The hand-crafted purpose-built structure is small enough to travel on the back of a lorry, but big enough to make usable space for a hobby room, studio or even accommodation. The story of the Artist Bothy began in 2011, when the school friends teamed up to work on an idea for a remote residency space in the Scottish Highlands. The simple shelter they designed was installed in a traditional woodland area in the Cairngorms National Park. It has since welcomed many artists looking to experience off-grid living in a spectacular and isolated setting. That initial structure marked the beginning of the Bothy Project - a non-profit organisation that operates an expanding network of unique residency spaces created in collaboration with artists, designers and makers. Sales of the bothies will help the project to partner with a broad range of organisations, artists and sponsors to grow the network and develop more residency opportunities across Scotland and beyond. 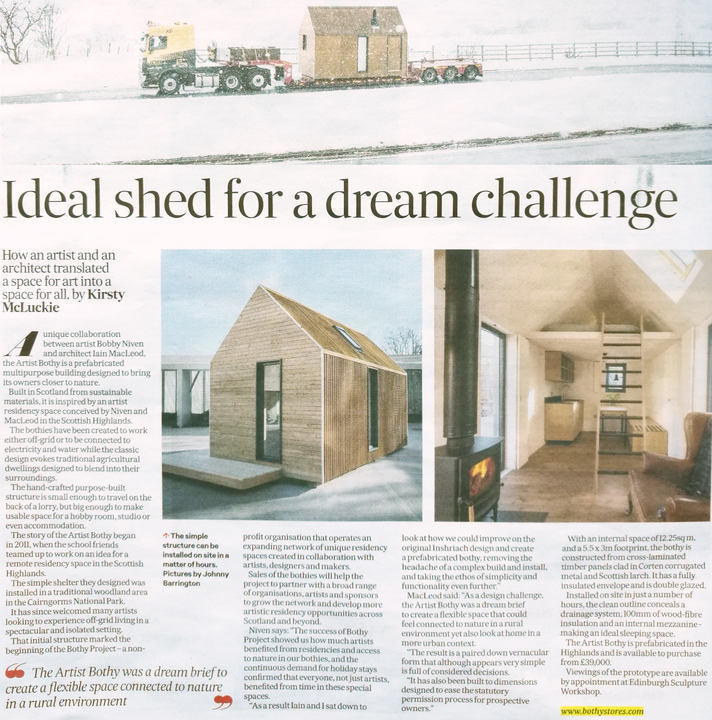 MacLeod said “As a design challenge, the Artist Bothy was a dream brief to create a flexible space that could feel connected to nature in a rural environment yet also look at home in a more urban context. The result it a paired down vernacular form that although appears very simple is full of considered decisions. With an internal space of 12.25sq m, and a 5.5 x 3m footprint, the bothy is constructed demo cross-laminated timber panels clad in Corten corrugated metal and Scottish larch. It has a fully insulated envelope and is double glazed. Installed on site in just a number of hours, the clean outline conceals a drainage system, 100mm of wood fable insulation and an internal mezzanine - making an ideal sleeping space. The Artist Bothy is prefabricated in the Highlands and is available to purchase from £39,000. Viewings of the prototype are available by appointment in Edinburgh Sculpture Workshop.